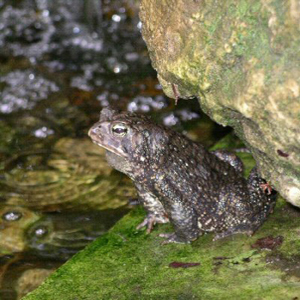 Typical of the genus Bufo, American Toads are short, squatty animals. The skin is dry and rough, and there are one or two large warts in each dark dorsal spot. 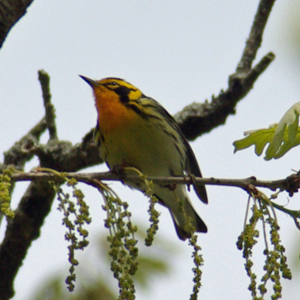 The ventral surface is cream colored with a scattering of dark spots or mottling on the chest. The background color is brown, never olive green. 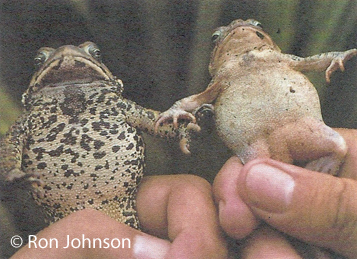 Two large glands behind the head, the parotoid glands, are present in all toads and in this species are not in contact with the cranial ridges (see figure). 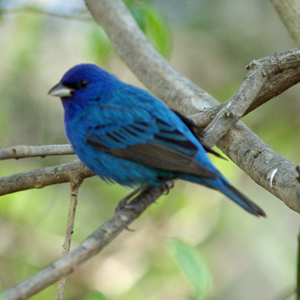 Males have a dark gray throat pouchs. These are fairly large toads growing in Iowa to a length of 3 3/4 inches (94 mm). At first glance, American toads are easily confused with Iowa's two other toad species. The Woodhouse's toad however, can be distinguished by its unspeckled breast, cranial ridges in contact with the parotoid glands and often two or more warts per spot. Great plains toads also have the cranial ridges in contact with the parotoid glands, have light bordered dorsal blotches, and have many warts, usually at least seven, in each dark olive dorsal marking. 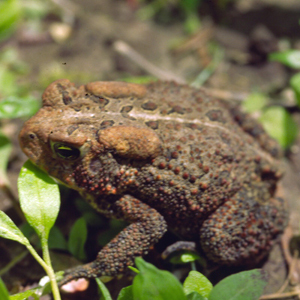 The American toad, Bufo americanus americanus, is the only recognized	subspecies found in Iowa. The call of the American toad is a loud, melodious trill lasting many seconds, sometimes half a minute. American toads call in late April and May. They breed in almost any pool that holds water through June, when the tadpoles metamorphose. Toad tadpoles are surprisingly small and are usually black. 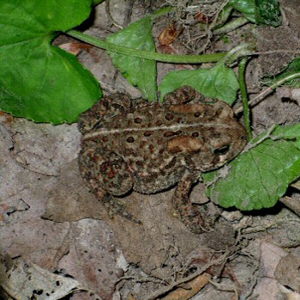 American toads are abundant in most of Iowa, especially in forested areas. They tend to be replaced by Fowler's toad in southeastern Iowa and are rare in the western tier of counties where other toad species occur.